Despite low oil prices, the steel fabrication and metal working industry is looking to sustain its growth in the UAE and the region. Steel fabricators are banking on commitments by regional governments to continue spending aimed at keeping the economies growing. Besides, most Gulf countries have reiterated their decisions to carry on with their infrastructure plans, a move that will keep the order books full for fabricators. 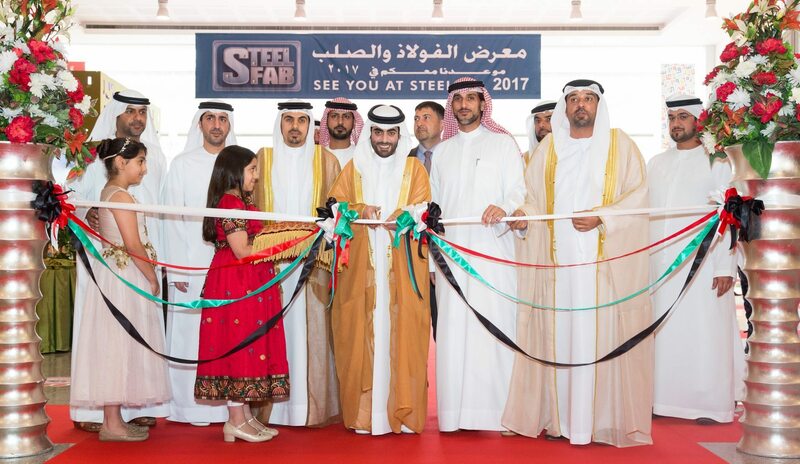 Aimed at providing the regional steel fabrication and metal working industry a leg up, the 12th SteelFab 2016 got under way at Expo Centre Sharjah on Sunday (January 17). It will continue until Wednesday (January 20). The four-day exhibition was inaugurated by H.E. Sheikh Khalid Bin Abdullah Bin Sultan Al Qassimi, Chairman of Sharjah Sea Ports and Customs, in the presence of Mr. Saif Mohammed Al Midfa, CEO, Expo Centre Sharjah; other officials, dignitaries and industry representatives. “The UAE is the least affected by low oil prices… thanks to our diversification policies and increased reliance on the non-oil sector. In fact, the non-oil sector now contributes nearly 69% of our GDP. This has had a direct and positive bearing on the steel fabrication sector, which is now an essential cog in the wheel of our economic growth,” said Mr. Saif Mohammed Al Midfa, CEO, Expo Centre Sharjah. The steady demand from the core sectors led by the continuing infrastructure projects are encouraging regional fabricators to look at acquiring cutting-edge equipment, advanced technologies and applications for all their metal forming, fabricating, welding and finishing needs, thus underscoring the importance of SteelFab and its increasing exhibitor as well as visitor turnout every year. The 12th SteelFab 2016 is showcasing more than 370 exhibitors representing nearly 1,000 brands from 43 countries at all the six halls of Expo Centre Sharjah, besides new special focus areas, special pavilions, live displays, technical seminars and product presentations. The past edition of the show had featured 350 exhibitors and attracted 10,324 trade visitors – a 15% rise — from 83 countries. The opening ceremony also saw the launch of a new vertical — Fasteners World Middle East – besides the introduction of two special focus areas – Stainless Steel and Wear Resistant & Hard Facing Cladding. “With the addition of Fasteners World ME and the new special focus areas, the SteelFab is now the largest and most comprehensive industrial event of its kind in the entire region,” added Mr. Midfa. The other special focus areas that help SteelFab provide the widest product coverage include Welding & Cutting, Machine Tools and Pipe & Tube Machinery along with the three special segments of Steel-Tech, Fabricators Pavilion & Steel Showcase. Industry observers point out that a depreciating euro against the US dollar also offers regional fabricators a great opportunity to source machinery from Europe at an economical rate, given that SteelFab features several pavilions and exhibitors from Europe. The Euro to US dollar exchange rate has been hovering around $1 for quite some time, which is a significant fall from over US$1.35 just 18 months ago. Foreign pavilions at the show Germany (23) and Taiwan (22), apart from strong presence of manufacturers from Italy, Turkey, China and India. The technical seminars will look into topics such as lean manufacturing solutions, application of PFP materials, advance processing technologies, reverse engineering and software applications, among others. The show is open to trade visitors from 10 am to 7pm and will run till 20th January at Expo Centre Sharjah.